Hight claimed his second Funny Car triumph of the season with a run of 3.867 at 331.61 in his Auto Club of Southern California Chevrolet Camaro SS to defeat Tim Wilkerson. After earning his third No. 1 qualifier of the season on Saturday, Hight secured his second Wally of the season and 47th of his career. Hight beat Terry Haddock, Ron Capps and father-in-law John Force, while Wilkerson took down Dave Richards, Cruz Pedregon and defending event winner Jack Beckman. Crampton locked in his first victory since this event last year on a holeshot win against Clay Millican, with a pass of 3.769-seconds at 329.89 mph in his DHL / Kalitta Air dragster. The 2017 Pro Stock champion Butner powered his Jim Butner’s Auto Chevrolet Camaro to victory with a run of 6.505 at 212.29 over Alex Laughlin. Like Hight, this was Butner’s second win of the season. Hines raced to his first win since the 2017 season finale with a run of 6.752 at 199.17 on his Screamin’ Eagle Vance and Hines Harley-Davidson Street Rod. That was enough to defeat his teammate and defending event winner Eddie Krawiec. Final finish order in NHRA Gatornationals at Gainesville Raceway. TOP FUEL: 1. Richie Crampton; 2. Clay Millican; 3. T.J. Zizzo; 4. Doug Kalitta; 5. Steve Torrence; 6. Leah Pritchett; 7. Brittany Force; 8. Jordan Vandergriff; 9. Terry McMillen; 10. Dom Lagana; 11. Mike Salinas; 12. Austin Prock; 13. Antron Brown; 14. Scott Palmer; 15. Pat Dakin; 16. Chris Karamesines. 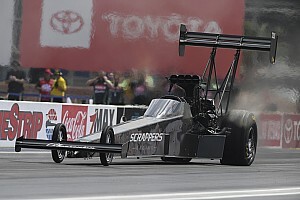 Final: Richie Crampton, 3.769 seconds, 323.89 mph def. 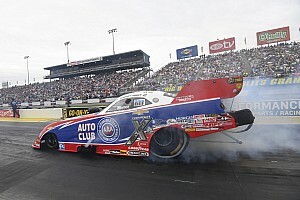 Clay Millican, 3.756 seconds, 324.67 mph. Final: Robert Hight, Chevy Camaro, 3.867, 331.61 def. Tim Wilkerson, Ford Mustang, 11.165, 92.63. Final: Bo Butner, Chevy Camaro, 6.505, 212.29 def. Alex Laughlin, Camaro, Broke. Final: Andrew Hines, Harley-Davidson, 6.752, 199.17 def. Eddie Krawiec, Harley-Davidson, 6.762, 198.90. TOP FUEL: 1. Doug Kalitta, 246; 2. Leah Pritchett, 204; 3. Steve Torrence, 197; 4. (tie) Richie Crampton, 178; Billy Torrence, 178; 6. Terry McMillen, 166; 7. Mike Salinas, 161; 8. Clay Millican, 157; 9. Antron Brown, 150; 10. Austin Prock, 138. FUNNY CAR: 1. Robert Hight, 330; 2. Jack Beckman, 225; 3. Matt Hagan, 215; 4. John Force, 200; 5. Tommy Johnson Jr., 191; 6. Tim Wilkerson, 165; 7. Bob Tasca III, 163; 8. J.R. Todd, 159; 9. Ron Capps, 146; 10. Shawn Langdon, 143. PRO STOCK: 1. Bo Butner, 301; 2. Alex Laughlin, 229; 3. Jason Line, 189; 4. Erica Enders, 186; 5. Matt Hartford, 185; 6. Rodger Brogdon, 184; 7. Jeg Coughlin, 180; 8. Deric Kramer, 166; 9. Kenny Delco, 141; 10. Chris McGaha, 137. PRO STOCK MOTORCYCLE: 1. Andrew Hines, 124; 2. Eddie Krawiec, 106; 3. Hector Arana Jr, 76; 4. Joey Gladstone, 72; 5. Matt Smith, 63; 6. Ryan Oehler, 54; 7. (tie) Jerry Savoie, 53; Jim Underdahl, 53; 9. Angelle Sampey, 35; 10. (tie) Hector Arana, 32; Karen Stoffer, 32; Melissa Surber, 32.